My brother asked me a couple weeks ago who wrote the plays. I told him Shakespeare. And also I don’t care about the authorship hubbub. It doesn’t interest me and I’d rather spend my time on the plays, not on the conspiracy theories. He said he liked the noise. 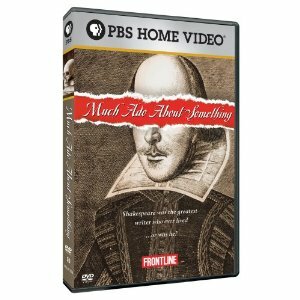 Then I remembered when I was searching for video versions of Much Ado About Nothing, I had seen available on Netflix a 2002 Frontline episode called Much Ado About Something. So, I put it in my queue. Well, I feel in my gut that Shakespeare was not the author. I don’t think the proof against him is conclusive, but he just doesn’t feel and smell like the author to me. Okie dokie. He believes Christopher Marlowe’s 1593 murder was staged, that Marlowe escaped to Italy and wrote the plays attributed to Shakespeare. He believes Shakespeare was an actor and plausible front man who received Marlowe’s manuscripts and slightly modified them. So, they become writing partners with Marlowe providing the learning and the great themes and Shakespeare the heart and soul of merry England. In other words, Shakespeare adds the farce… Falstaff, Dogberry, Bottom. Right. So Rubbo substantiates his thesis with a series of annoying interviews with “experts” whose expertise I question and with academics whose interviews are edited to make them appear a bit dotty. His basic argument is that Shakespeare was not educated enough to write these plays and so it just doesn’t seem like he could have done it. There is a lot of time spent describing parallels, similarities and even word-for-word matches between works attributed to Shakespeare and Marlowe. The conspirators analyze these and use their findings as proof that the works are from the same hand. The explanation given by scholars seems to be that the modern concept of plagiarism didn’t exist in Elizabethan times and that Shakespeare was not above lifting good ideas (sometimes verbatim) when it served him. And then there is a lot more noise, errr, I mean additional evidence regarding the lack of record for various things that Shakespeare should have done if he’d really written the plays. He’s guilty of such sins of omission as not having any record of books in his estate (the writer of these plays would have owned lots of books! ), he apparently didn’t bequeath money to the grammar school he might have attended (if that’s where he got his education, he should have donated money to them! ), etc. Umm, I just did not find anything about this particular show believable or intriguing. I’m sure there is better stuff out there regarding authorship, but I’m not particularly interested. There is a lot of back and forth on the PBS forum for this show. Noise. Endless noise. To paraphrase Mr. Rubbo, well, I feel in my gut that Shakespeare was the author. I don’t think the proof against him is conclusive, and he just feels and smells like the author to me. Noise, Steve. Got anything better for me?